In the summer of 2009, on the occasion of the 50th anniversary of Jamyang Khyentse Chökyi Lodrö’s passing away, Sogyal Rinpoche gave this rare recounting of his memories of Jamyang Khyentse and his early life in Tibet. Jamyang Khyentse is the ground of my life, and the inspiration of this book…Had I not met my master Jamyang Khyentse, I know I would have been an entirely different person. With his warmth and wisdom and compassion, he personified the sacred truth of the teachings and so made them practical and vibrant with life. Whenever I share that atmosphere of my master with others, they can sense the same profound feeling it aroused in me. What then did Jamyang Khyentse inspire in me? 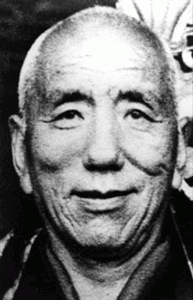 An unshakable confidence in the teachings, and a conviction in the central and dramatic importance of the master. Whatever understanding I have, I know I owe it to him. This is something I can never repay, but I can pass on to others. This video is the second of a series on Remembering the Masters, featuring short teachings and stories about Sogyal Rinpoche’s masters. Further videos in this series will be presented over the coming weeks. To see the first video in this series, please go here.